So you want to start a business, huh? Hopefully you have a business plan. I'm not talking about a 500 page document with footnotes and appendices -- this isn't for a college class. I mean a written outline of what you want to do. Step 1, step 2, step 3 and so on. You should also set up a budget. Again, not something that requires an accountant. I'm talking about a list of costs so you know how much money you need. Just ask yourself, what do I need to get this business started and write that all down. Then do some research and find out how much it all costs. Simple, right? But how do you budget for something like technology? I mean you can't just buy a laptop and think you're finished. Of course not. What about communications? Email? Website hosting? Internet Chat? Scheduling? Collaboration? Document sharing? What? You think you can get away with doing business in the 21st Century without a website? Or an email with your business name in the .com part? Let me let you in on a little secret - no one is going to take you seriously with a Yahoo.com email address. We're in the 21st Century. Act like it. I can set you up with all of those business tools, and many, many more for a one time payment of only $197.00. Click here now! Your own internet domain name (.com, .net, .org, etc.). Up to 50 email accounts (YourName@YourDomain.com). State-of-the-art email antivirus and anti-spam protection built-in. Shared calendars for all your workers or the whole world if you like. A downloadable private chat tool for your employees. Online space for sharing documents. Easy connection of all these services for most smartphones, like the iPhone. All hosted on Google's state-of-the-art computer systems! And much, much more... Click here to learn more! Only new businesses can apply for this offer! The way we are going to grow our economy is for entrepreneurs (like you!!!) to start the next big thing. There's no reason to wait -- Click here now! BONUS! 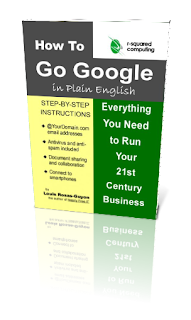 Plus you'll also get my Plain English user guides included, at no extra charge. Because I'm a nice guy like that. Remember what Warren Buffet, the richest man in America said: When others are greedy, be cautious. When others are cautious, be greedy. It's time to get greedy my friends. There has never been a better time to start your business. And $197 gets you started right away. Click for more information now! If you aren't 100% happy, dancing-in-the-streets satisfied, I will refund 100% of your money -- no questions asked. That's my personal, iron-clad guarantee. Sign up now! Only $197! !